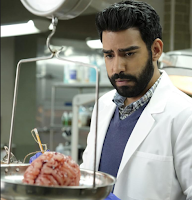 iZombie is back and oh how I’ve missed this show. The 3rd season was very much a mixed bag in which some parts were great, but especially towards the end it very much wasn’t. A lot of people have fallen out of love with the show as a result. Whilst I looked forward to the 4th season arriving, I was also slightly wary, hoping against hope that the show would learn its lessons from how badly the 3rd season dwindled. “Are you ready for some zombies?” has me feeling extremely hopeful of that. It was an excellent premiere that moved at a great pace, with not one bit of it feeling fillerish. At the end of the 3rd season, the zombies were indeed exposed to the world. As a consequence of that, Seattle is now a closed off city with walls all around it. The human’s who were unable to escape are forced to live side by side the zombie population, and whilst some may be ok with that others aren’t. This leads to houses being marked with a Z to indicate zombies live there, choice words and attempts to kill zombies. Filmore Graves acting as the higher authority are doing their best to keep the peace, and assure the humans of Seattle they’re not in danger. There’s a curfew forbidding anyone to live their homes after midnight, factories of brains and the zombie bars to try and keep the hunger at bay and stop the zombies feeding on the human’s. Only problem as we’re told on a few occasions throughout the premiere is Filmore Graves don’t have enough officers, and there clearly aren’t enough brains for everyone when the zombie population is outnumbering the human’s. Zombies working with the police is no longer a secret, with Liv and Clive joining Bozzio and other Police Officers in conversation regarding working on zombie brain. Clive also informs a victims wife of a vision Liv has. Thankfully none of this makes Liv’s personality changes any less amusing. Eating the brain of a Seahawks fan causes Liv to go into beast mode, when a potential suspect dares to insult them. Finding an actor capable of switching between characters on an episode by episode basis is extremely difficult. Too much and the performance is cringe worthy, too little and it’s just not believable. Rose McIver thankfully is one actor who has got this absolutely mastered. It is true to say at the beginning of the show Liv’s personality changes were subtle, compared to how blatant they are now, and that change did occur when she was forced to reveal to Clive she was a zombie. It’s almost as though it gave the writers leeway in fully exploring just how much the zombie brains change Liv, but considering Clive’s reactions to her personality changes are still as bemused as always, it’s a small thing I can deal with. Ravi is also going through some changes following the season 3 finale, becoming a part time zombie. From Liv’s comments to it being his time of the month, to walking around naked due to being on a nudist professor’s brain it’s hilarious. Obviously it won’t always be a laugh and I expect more dramatic moments down the line, but for a premiere easing its audience back in, sometimes laughs is the best way to go. Blaine’s business is thriving but with his father out of the well now, I don’t see that lasting for long. On his own Blaine is the villain I love to hate, due to David Anders being such a great actor. Blaine never feels as though he’s over stayed his welcome, and coming into Liv’s orbit is always a treat. The same cannot be said for his father. Robert Knepper is a decent enough actor, and introducing Blaine’s father did at the beginning provide Blaine with some character development. We got to see how exactly he came to be as he is, and his father’s attitude towards him made Blaine a somewhat sympathetic villain. That is however all done with now. We don’t need to see Blaine & his father going head to head over their business, or whatever other family drama the show can conjure up there. That screen time could quite easily go to bringing back Liv’s mother and brother, who haven’t been seen or head of since Liv was forced to reveal she’s a zombie. 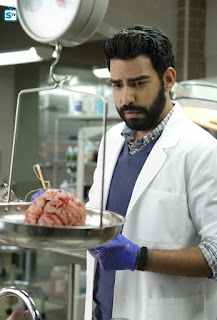 The show also hopefully seems to be leaving Major’s zombie struggles behind it, and instead bringing back his experience as a youth worker to try and help zombie teens. They’re starving out on the streets which is causing them to turn to crime as a means of being able to eat. Granted Chase’s interest in using Major’s skills is just so they can recruit more soldiers, but it gave us a different perspective on how hard zombie life can be. You can watch the next episode on The CW tomorrow at 9pm.